Why have disproportionate levels of harassment and assault long been the everyday experience of food workers on farms, processing plants, kitchens and dining rooms? What role has the media played in eliding these issues? How do we all move the conversation forward now that the #MeToo spotlight has accelerated the pressure on the food industry? 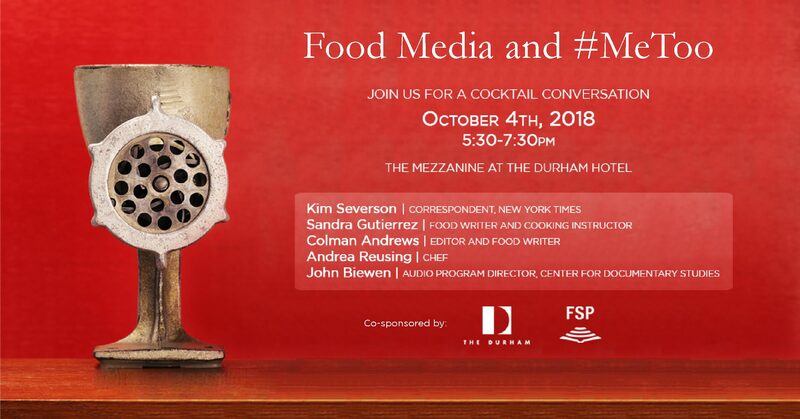 Join us for a cocktail conversation with Kim Severson, Sandra Gutierrez, Colman Andrews, and Andrea Reusing, moderated by John Biewen, and co-sponsored by the Forum for Scholars and Publics at Duke University. Snacks are included and cocktails will be available for purchase.